Sen. Christopher Dodd (D-CT) is in trouble. National media yesterday reported that Sen. Dodd admitted "that he had been involved in key legislative changes that helped pave the way for AIG to pay controversial bonuses to its employees." His hometown newspaper, Hartford Courant, reported "In a retreat from earlier statements, Dodd said Wednesday that U.S. Treasury Department officials had approached him last month, urging him to modify an amendment to the federal stimulus bill that capped bonuses for executives at companies receiving aid. On Tuesday, Dodd said that he was not a member of the conference committee that crafted the final compromise bill and said that the exception had not been in the bill as he drafted it. But late Wednesday, Dodd admitted in an interview with CNN that he had been involved in the change." Dodd said he "agreed reluctantly" to the changes because Obama administration officials "were insistent." He refused to disclose which administration "officials" asked him to make the changes that benefited executives at AIG who were awarded massive bonuses at taxpayer expense. We could speculate who it was that convinced Sen. Dodd to make these changes. Was it Treasury Secretary Timothy Geithner? After all he worked for two Republican administrations and for Henry Kissinger's private consulting firm. 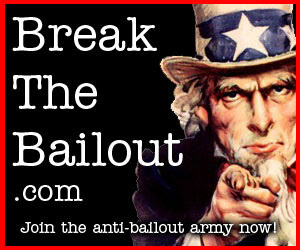 Geithner orchestrated the recent bailouts of Citigroup and AIG. Maybe it was President Obama himself who asked Sen. Dodd to change the legislation so it would benefit AIG. We know that during the recent presidential campaign Obama raised the most money in US history. Obama got nearly $7 million in campaign donations from Wall Street investment firms. Notice how many Democrats are in the top 10. It goes to show that Washington corruption is an equal opportunity business. Keep your eyes on the ball. This story is likely not over. In Monday's Washington Post the Obama administration signals their opposition to the legislation passed in the House last week that would tax 90% of the bonuses paid to AIG. "I think the president would be concerned that this bill may have some problems in going too far -- the House bill may go too far in terms of some -- some legal issues, constitutional validity, using the tax code to surgically punish a small group," Jared Bernstein, the top economic adviser to Vice President Biden, said on ABC's This Week. "That may be a dangerous way to go." Excuse me - talk about going to far! These corporate fat cat bonuses are about as far as you can go. What is Obama drinking over there at the White House? Is he not hearing (or caring about) the cacophony of voices across the country expressing utter outrage at these bonuses? Obama says he was angry about the AIG bonuses but now he is backing off doing anything about them.....this ain't going to go over well with the public. Obama is leaving himself open to right-wing populism on this one......watch out, the hope and change express is coming off the tracks. His left hand and right hand are not in sync. This morning I was still in bed when everyone from our house came into the room to hear about the trip. Of course I talked all about the food, what I ate for each meal, as I usually do when I return. What sights did I see? Oh yeah, sure, but first let me finish about the food! 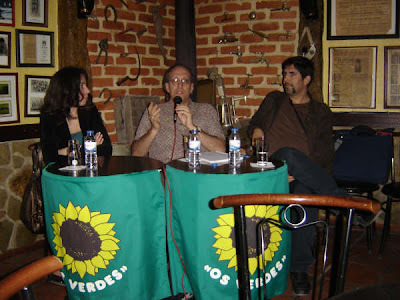 The photo above was taken Wednesday night when I spoke in Setubal at a bar. The Greens in Portugal have two members of the national parliament. The woman on the left in the photo is Heloisa Apolonia who is one of these MP's. The man on the right is Victor Cavaco who is a paid worker for their party. He organized my trip and made sure I was well taken care of. These folks in Portugal are very well organized and are very serious about serving the people by working on issues that are important to them. I'll write more about all this in the coming days when I do my usual trip report. But clearly the Green Party in Portugal is one that could be used as an example of how to do it right. As I write this I am listening to a music CD Victor gave me by the artist Carlos Do Carmo. It's very beautiful. My feet are tapping the floor - not bad for someone who has little energy. When I visited a town called Santarem I was interviewed by a regional TV station and was told it will be available on-line soon. Once I find it I will post it here so you can see it. They filmed me and my hosts that day walking throughout the ancient city so there should be some interesting footage to go with the interview. 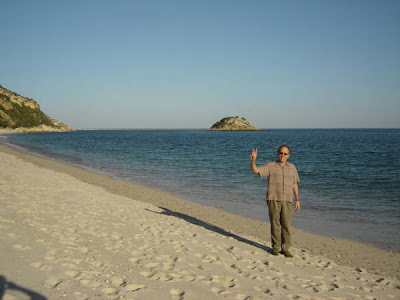 Later that evening I did a talk at a local bar in Setubal and made it back to my hotel in Lisbon right at midnight. Then I had an hours worth of emails to catch up on and was in bed by 1am. The hotel wake-up call was right on schedule at 6am and by quarter-to-seven I was in a cab on the way to the airport. I'm writing this from the airport in Newark, NJ waiting for my plane to Boston that has been delayed for an hour. That means I won't get back to Maine until 10pm if all goes well. I have to grab a bus from Boston to Portland and then MB will pick me up in Portland for the 45-minute drive back to Bath. All this travel is not so glamorous at times. I am beat and can look forward to one day of rest before heading to do a workshop at a conference in Bangor on Saturday. MB will also be a speaker and friend Joseph Gerson, who just led the effort to plan the No US Bases Conference in DC, will be the keynoter. He always has something interesting to say. I could go for a beer right now. Shouldn't we be talking about changing the entire economic system in the US? Isn't it time to recognize that giving more money to these Wall Street crooks is just plain stupid? I am back in Lisbon after two days up north visiting ancient cities and seeing the sights in the countryside. Various members of the Portugal Green Party have been showing me around. They are really great folks and have built a solid national organization. They are crystal clear that you build the movement around issues and the political power flows from that. They don't try to run candidates without having first become deeply involved as a party in the life of the people. They know what they are doing. I've done several media interviews and came up with a line that all the media here love. They all ask about Obama and I say: Bush was a bad cowboy, Obama is a good cowboy, but he is still a cowboy. 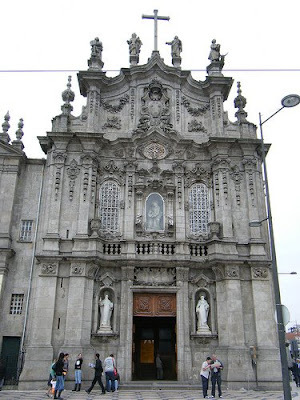 Today I will be taken for a day of touring south of Lisbon and I leave for home early Thursday. I'm saving my best stories for my trip report. So you will have to wait. In the meantime let me share with you some of the heat in Portugal - watch the video above, it will make you hot under the collar. [T]he administration would use a $30 billion installment of bailout funds approved March 2, to bring some pressure to bear. The official said before AIG can draw down funds from the $30 billion, new rules would be written into AIG's contract. The idea: to ensure no government money goes toward paying financial products division bonuses and that the cost of bonuses already paid would be recouped for the taxpayer. However, the official said, Treasury has determined there is no way the government can actually extract the money from the individuals who received the bonuses. 1) Why weren't these rules written into the AIG contract in the first place? 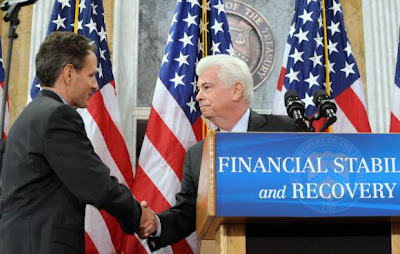 Geithner is in charge of that department, both as Treasury Secretary now and as the backer of the original AIG bailout when he was head of the New York Federal Reserve. Given that he was in charge of both AIG bailouts, why isn't he taking a lot more of the blame for this? More than anyone else in the government, Geithner could have prevented these bonuses. He failed. 2) Further, given that we were promised improvements in TARP under the Obama administration, why did it take a public outcry to actually improve these contracts? Larry Summers sent a letter that dissuaded Senator Chris Dodd from passing legislation to legally mandate improvements TARP. Given the promises that were made, why aren't there guarantees against this sort of excess in all TARP contracts written by the Obama administration? Larry Summers promised us there would be. He failed. Maybe its time for the "very severe hostility" Chris Dodd had threatened? 3) Why isn't everyone at AIG involved in the scandal about to be fired? We own 80% of the company, so we should be able to hire and fire people, right? And even if we can't just hire and fire people, we can apparently still change the contract. As such, why can't we make firing people involved in the scandal conditions in the contract? Everyone involved in this should be fired. They took $170 billion in government money than used it to line the wallets of already wealthy employees. Fire them now. 4) Finally, there is a fairly obvious legislative solution that will allow us to get the money back: just pass a law requiring a 100% tax on bonuses paid to employees at companies that have received bailout funds. In fact, Representative Carolyn Maloney is about to introduce a version of said legislation. In the current political environment, where only 14% of the country opposes giving back these bonuses, it probably has about a 99% chance of passing. As such, why do Summers and Geithner keep saying there is no way to get the money back? Clearly, there is a way. Are they lacking in imagination, or are they protecting the executives? I am getting really sick of Geithner and Summers. If they were serious about fixing TARP, then conditions against employee bonuses would already have been in the contracts they wrote (Geithner) and promised us they would write (Summers). If they were serious about punishing the people involved, they would include requirements to fire those people in the new contracts (which they are not talking about doing), and they would not have incorrectly stated that there was no way to get the money back (they would have at least said they were looking into it). It is becoming hard to avoid the conclusion that Geithner and Summers are working to protect the Wall Street executives at the financial institutions that are receiving TARP money. Its either that, or they are demonstrating a lot of incompetence. No matter which is the case, I have created a petition asking President Obama to replace Geithner and Summers on his economic team. We need people who are serious about changing TARP to be running TARP. Geithner and Summers ain't it. And now ladies and gentlemen, for your listening pleasure. A five-minute diatribe by one of our noble American military (heroes) in Iraq instructing a group of Iraqi policemen how to be "men" and how they should go out and kill them some bad guys. As I listen to this I can't help but see the picture in my mind of Gen. George Crook instructing the Apache scouts on how they need to step it up and go out and find Cochise and Geronimo who are hiding in the mountains of Arizona so the US can capture and kill them. Today Geronimo's skull sits in the Skull & Bones Tomb at Yale University where the Bush family and Sen. John Kerry both cut their teeth on learning Empire 101. It's no wonder the people of Iraq love us the way they do. I am now in the city of Porto up in the north of Portugal. It is a very old city and a beautiful place. My hosts last night drove me around to take a quick look at the sights before we went to dinner at a lovely restaurant along the river. This church is just in the square across from my hotel. It is just magnificent at night when it is all lit up. They told me last night that many of the most beautiful old buildings are now owned by the banks. Surprise, surprise. I arrived here on the train from Lisbon yesterday afternoon. My talk to the Green Party Congress on Saturday seemed to have been well received. I was very impressed with their party which seems very active and issue based. I sat through most of the agenda as did the couple hundred people in attendance. Usually, at such events that I go to, by the end of the day most people have left. Not so in Lisbon....they stayed, the spirit was really fine, and one of their two elected MP's ended the day with a rousing speech calling on their party (which is in coalition with the Communist Party) to stay focused on the issues that matter and remain true to their ideals. Some Greens in Europe, as they get power, have begun to shave the edges off their opposition to war and other important questions. The German Greens are one such example. The Green Party here seems refreshingly different. For the next couple of days I will be visiting different communities in the country for touring around and meeting with local activists. I am being treated so kindly it is just remarkable.